As part of the their annual traditional, the cast of Sunday in the Park with George at SF Playhouse was asked to sing the national anthem at the Giants game over the summer. Unlike the previous time with City of Angels where I had to since the alto line, this time I took my normal place down with the basses. Sam Hurwitt from the Mercury News also did an interview with Tim Pinckney, the author of Still at Risk. Richard Dodds from the Bay Area Reporter did an interview with the author of Still at Risk to learn more about the origins of the play and the parallels with Tim’s own experiences. Tim’s been closely involved with our world premiere at NCTC and he’s been wonderful to work with. Once a show has been running for four seasons it tends to not get a lot of press, but this article from Lily Janiak at the San Francisco Chronicle was a nice highlight! The cast of City of Angels at SF Playhouse was asked to sing the national anthem at the Giants game over the summer. Because the show is so heavy with men, the music director asked me to sing the alto line. I’m probably one of the few people who can say they sang the national anthem at a major sporting event entirely in their falsetto. 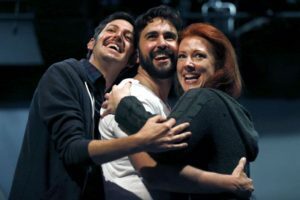 The SF Chronicle had a great article on the backstory behind the new version of On a Clear Day You Can See Forever that we’re doing at NCTC. Plus some fun rehearsal pictures of us! 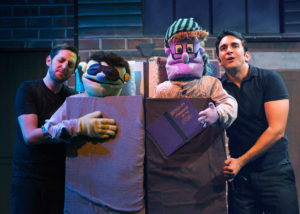 Our production of Avenue Q was featured in the weekly roundup by American Theatre editors. 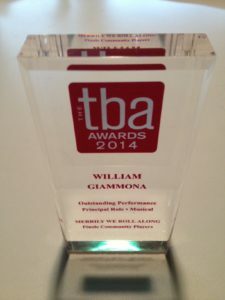 I’m so honored to have been selected as the 2014 TBA Award winner for Outstanding Performance by a Male Actor in a Principal Roles in a Musical. See the full list of award winners here. Theatre Bay Area has selected me as their featured member for the month of June! Read the interview here. Theatre Bay Area did an interview with Dennis and I to feature as a Valentine’s Day special about couples in theater. Read it here.